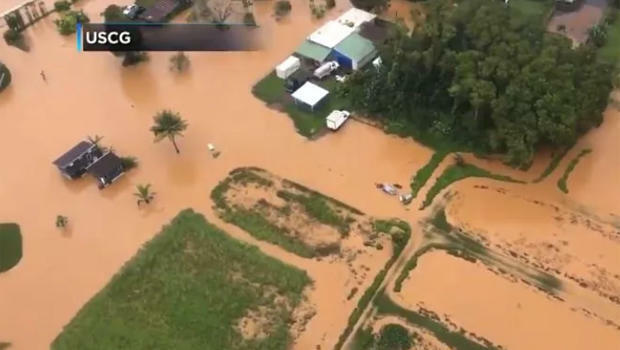 LIHUE, Hawaii -- Dozens of people were stranded at a Red Cross shelter on Kauai after a storm dropped over 2 feet of rain, causing massive flooding and grounding rescue helicopters. About 40 people - mostly tourists - were stranded Sunday at Hanalei Elementary School, where the American Red Cross had opened an evacuation shelter. "It's a pretty scary situation," Coralie Matayoshi, CEO of the Hawaii Chapter of the American Red Cross, told CBS Honolulu affiliate KGMB-TV. "They're completely surrounded by water. The original plan was to have them airlifted to the Church of the Pacific shelter, where food and water are waiting." Red Cross officials say food and water supplies ran out earlier in the day, but county crews were able to make it through the flooding to deliver more supplies. The Red Cross has also opened a third shelter at Koloa Elementary School for flood victims, bringing the total number of shelters open on the Garden Isle to three, the station says. The other two include Hanalei School and the Church of the Pacific location. There are about 40 people also at the Koloa shelter, officials say. The Coast Guard assisted local authorities to rescue hikers in the vicinity of Hanalei Bay on Sunday after sustained flooding and landslides due to heavy thunderstorms.